You have to love a city that boasts growing ornamental plants as its main industry. In fact, the city is a leading grower of poinsettias. 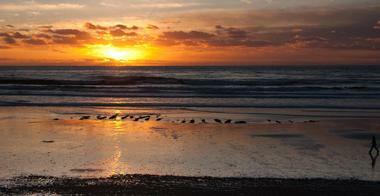 Encinitas, California, is also famous for being one of the best surfing and beach towns in the world. 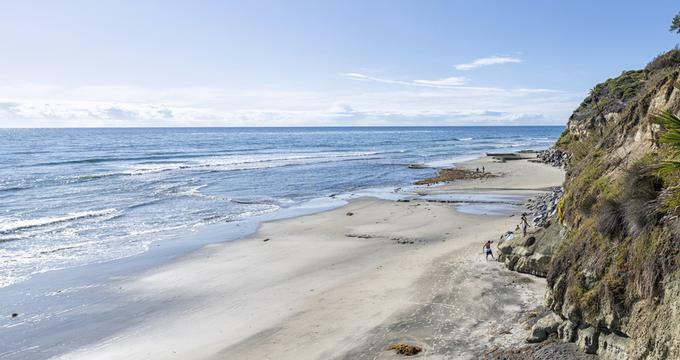 Only 25 miles north of San Diego, Encinitas has a distinct, quirky personality, attracting not only surfers that flock there for the city’s six miles of Pacific coast, but also visitors exploring the city’s great attractions, restaurants and shops. 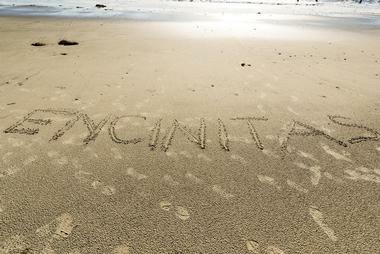 Here are the best things to do in Encinitas, California. Moonlight Beach starts where Encinitas Boulevard turns into B Street, and is one of the most popular beaches in Encinitas, both among locals and tourists. It is sandy and wide, great for kids and adults, and perfect for picnics, playing volleyballs, making sand castles, and much more. Moonlight Beach is an excellent swimming, snorkeling, and surfing beach, but it is also popular for surf fishing. The area boasts tennis courts and kids’ playgrounds, a space to rent beach gear, and a nice snack bar. The beach used to be very popular among locals for midnight picnics in the 1900s, which is how it became known as Moonlight Beach. You can still see people lighting bonfires and having late parties in the moonlight. As you stroll along four miles of trails, the San Diego Botanic Garden will amaze you with the diversity of its environments and the stunning plants that adapted to them – you’ll see everything from arid deserts to a tropical jungle and bamboo groves. The plants thrive, and you will enjoy different vistas, numerous flowering trees, majestic palms, and the largest bamboo collection in the country. 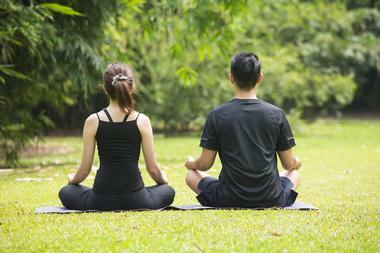 The San Diego Botanic Garden is one of the best things to do in Encinitas, California. Garden plants are divided in many exhibits such as desert gardens, a tropical rainforest with a large waterfall, a succulent garden, a subtropical fruit garden and many others. One of the most popular is Hamilton Children’s Garden with three acres of playground space filled with plants kids can play with and tend, including Toni’s Tree House. 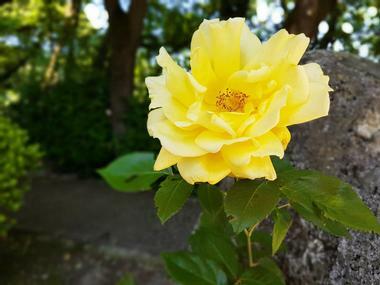 The garden has more than 3000 species of plants. For those interested in the spiritual activities at the SRF Temple, there is a program of lectures, meditation, Sunday School, and a range of other services. 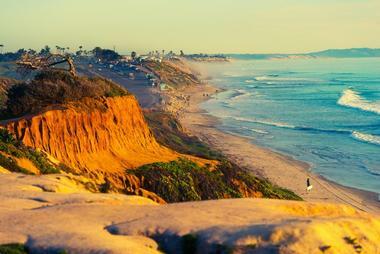 Just below the SRF Hermitage and Meditation Gardens is the popular Swami's Beach, one of the favorites among surfers. During the winter when the swells are particularly good, surfers often put on quite a show at Swami’s Surf Beach, one of the area’s most popular and most famous beaches. The best spot to watch them is from the park on the cliff above the beach. This lovely park is the main entrance point for Swami Beach and has many benches in the shade, several picnic tables, and a well-tended shady lawn. 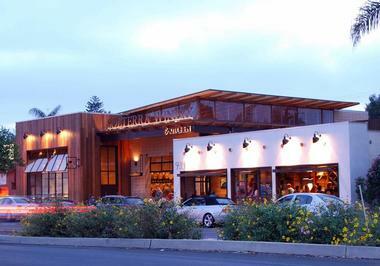 A short walk north will take you to Highway 101 with the popular Swami’s Café and a few other restaurants. 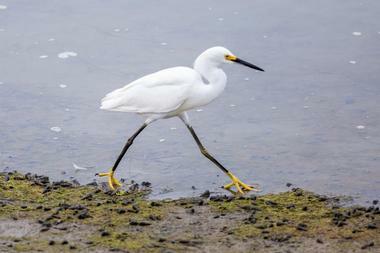 The 1,000-acre San Elijo Lagoon Ecological Reserve is one of the county's largest remaining coastal wetlands. Visitors can explore seven miles of trails hosting a diversity of plants and animals, including: 6 plant communities, 300 species of plants, 26 mammal species, at least 23 species of fish, and more than 300 bird species. Tide pools are located up and down the coast, and guided explorations are held throughout the year – more information can be found at the visitor center. Basic amenities such as lifeguards at intervals, bathrooms, and showers are available to all those looking for a fun day in the sun. A number of bakery vendors have stalls at the market with freshly baked muffins, cupcakes, cakes, and pies. 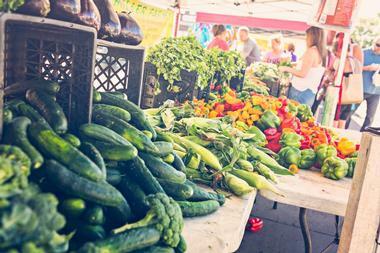 The market has a large food court and covered dining area for those wanting to grab a meal. Children will have a wonderful time – there’s a playground where they can play, and balloon twisting and face painting are usually available. On certain days the market invites live bands to come and perform. Lux Art Institute isn’t just a museum where you view spectacular art; guests are presented with an opportunity to make their experience one of learning, understanding, and beauty. See the artistic process firsthand and observe artists as they practice their art in the studio. Kids, teens, adults, educators – there’s something for everyone, including art classes, open studio, and special classes conducted by Lux Teachers. 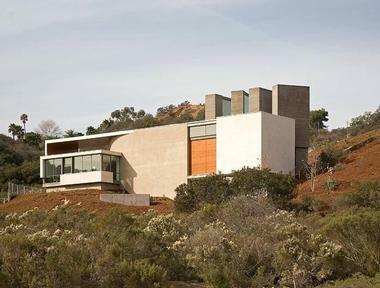 Some unique programs the institute offers include yoga, community tours, and “luxcursions,” which include a tour through the artist’s studio, exhibition areas, and sculptural installations and native landscape of the Lux grounds. Visiting artists from around the world are invited to the Lux Art Institute, and guests can partake in classes and events that take place throughout the year. The San Dieguito Heritage Museum was founded in 1988 to preserve the local history of the area. Historic artifacts, records, and stories of the San Dieguito River Area are on display in the museum. 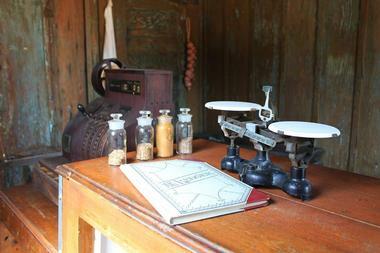 Visitors can relive the rich heritage by exploring local stories and photos from the past. The hands-on experience offers more than just a tour of museum; it also includes discovering a Native American grass hut, viewing a grinding stone exhibit, listening to Native American stories, and sand painting activities. Interactive activities such as churning butter, building a homestead shanty, and bartering in the general store paint a clearer picture as to how the settlers lived, and they are fun for children and adults alike. 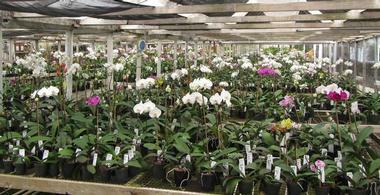 Family-owned and operated Cal Pacific Orchid Farm is a 36,000 sq. ft. greenhouse with hundreds of orchids from all over the world in various stages of bloom. Visitors are invited to enjoy the museum-like showroom, which also features gorgeous multi-plant orchid arrangements. Visiting the farm can be a learning opportunity for the entire family – the friendly staff are all experts in orchid care and even offer repotting services and plant boarding for people who may not have the time to care for their plants. Visitors of the Cal Pacific Orchid Farm are sure to leave with a stunning bouquet or custom floral arrangement. 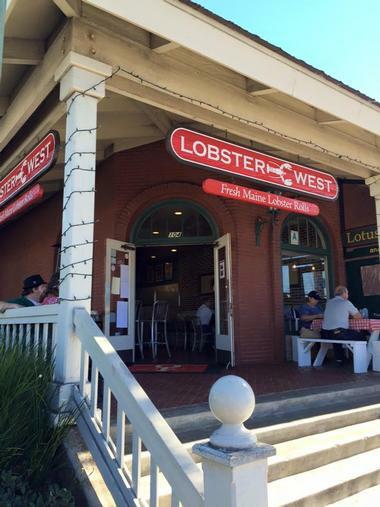 Lobster West is a must-visit for seafood fans. Fresh lobster is imported from friendly Maine fishermen and flown in each day, and the toasted and buttered fresh rolls are baked that morning. Each roll is made with generous chunks of lobster and accompanied by house-made coleslaw and Cape Cod chips. To make the meal perfect, try their lobster bisque or New England Clam Chowder. The restaurant is cozy, unpretentious, and friendly, with little sitting nooks for privacy, fun nautical décor, and plush cushions. It’s a little corner of Maine right in California. A family-owned winery and kitchen, the Solterra Winery has been up and running for the past fourteen years. Solterra offers an educational and satiating experience; visitors can watch and learn about the wine making process with a tour of the winery and then enjoy a lovely meal accompanied by a glass of wine produced at the vineyard. 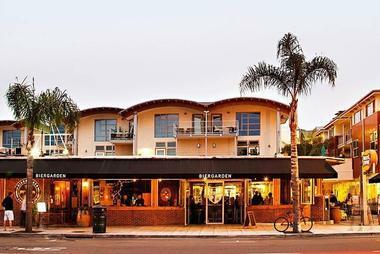 Lumberyard Tavern is a neighborhood saloon, a perfect spot for visitors to get a sense of old Encinitas when lumberyards were as common as surf shops are today. It is spacious, fun, and lively, with a number of large TVs for sports fans and comfortable booths for families and groups of friends. The menu has everyone’s favorites such as delicious pulled pork sandwiches, “as good as mama’s” meatloaf, and fabulous juicy burgers. But, it would not be a saloon if it did not have a booze selection to be proud of; they have fourteen bourbons, forty Scotch whiskey blends as well as single malts, Tennessee whiskeys, and an ever-changing selection of excellent beers on tap. Kick back and enjoy, and if you brought your pooch with you, relax on their spacious front patio. Water bowls are provided, and you can share your goodies with your best friend. 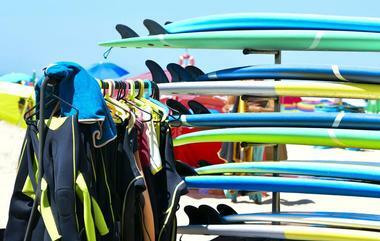 Reviewed as the “ultimate California experience,” the Leucadia Surf School does just what you’d imagine – they provide surfing lessons. Whether you’re looking for private lessons or group lessons, there’s something for everyone. Open seven days a week, the school provides visitors with a softboard and a wetsuit and offers basic instructions before students ride the waves. You have nothing to fear because an experienced instructor is with you at all times. Already know how to surf? No problem, because Leucadia also does just rentals – they’ll give you some tips on where to catch the best waves and surf right alongside you. 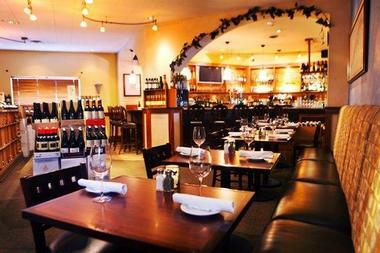 The 3rd Corner is a wine lover’s idea of heaven: wall-to-wall wine. Most of the time, there are about 600 bottles of wines from all over the world stacked all around, with small dining tables tucked between them. Called a “wine restaurant,” 3rd Corner is a wine shop that also serves food. So, you can stroll around, look at the labels, check the years, pick a bottle or two, and then sit at the table to have dinner. The retail prices of wines might be surprising, but wait until you find out that you can open one of the bottles you chose to accompany your dinner for only $5 more. The menu is another very pleasant surprise. 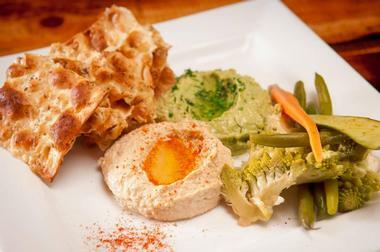 It is wine-oriented, but very inventive, and the cuisine is superbly prepared. The best time to come is on Sunday for a prix fixe 3-course menu with a wine pairing. You might learn a thing or two, and you will surely have a memorable experience. Hitting a few rounds of golf has never been more picturesque than it is at the Encinitas Ranch Golf Course. The course is located on a sweep of bluffs with a spectacular view of the ocean. 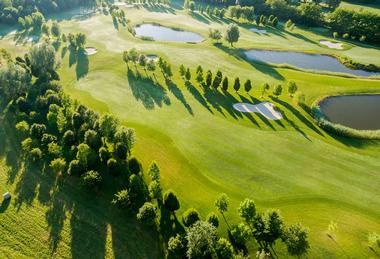 Golfers will appreciate the layout, five sets of tees, and the open fairways. For those just looking to spend a stress free day enjoying the outdoors, there is a 6,000 square foot clubhouse with a full bar, café, and adjoining patio. 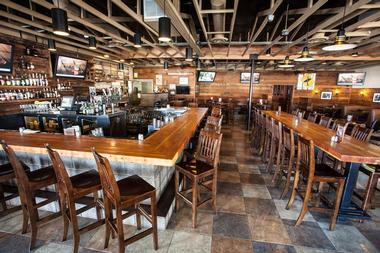 The Bier Garden of Encinitas is a great place to hang out with friends after work or after a day on the beach. You can perch on a vivid green stool in front of 32 tap handles offering some of the best craft beer from Southern California. The menu is designed to work well with beer, and it is unique, very SoCal, and satisfying whether you go for a full dinner or choose a bunch of small plates such as skewers with chicken thighs marinated in peanut sauce or short rib corn nachos with mango salsa and tomato soaked in Bier cheese sauce and chipotle aioli and served with tortilla chips. You also might want to sample their very interesting Bloody Mary menu. They come with beer chasers. Union Kitchen and Tap is a large rustic tavern with a massive bar, long communal tables, brick walls, and very comfortable seating. The space encourages you to hang out with friends over one of their many craft beers or small plates of New American cuisine with Southern touches. Executive Chef Michael Lina is a wizard with shared plates that include delights such as Thai Coconut Mussels or Octopus Lyonnaise. The menu is huge and changes seasonally. Union has a nice wine selection and a range of imaginative cocktails. Dogs are allowed on their small patio, and there is even a special menu for man’s best friend. 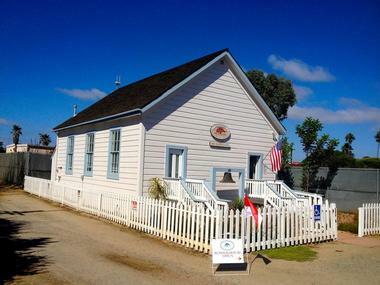 Visitors to the Encinitas Historical Society are in for a treat, as the organization is located in an 1883 one-room schoolhouse built for the eight children who lived in the town at that time. Walk across the original wood floors to discover the unique city and its history through photographs, exhibits, research papers, and docents eager to share their story. Visitors will fall in love with this quaint beachside community during one of the many tours scheduled by the Encinitas Historical Society. These tours showcase landmarks and festivals, and give visitors an opportunity to get to know the friendly locals.